In this method multiply the multiplicand by each digit of multiplier and then add up all the properly shifted result. This method is also called grade-school multiplication. 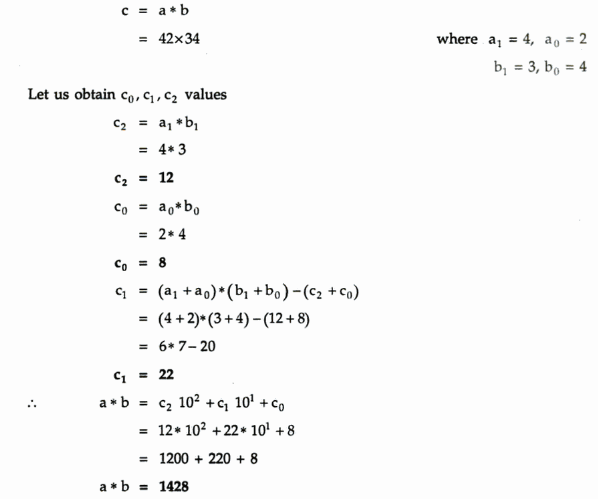 But this method is not convenient for performing multiplication of large integers. Hence let us discuss an interesting algorithm of multiplying large integers. 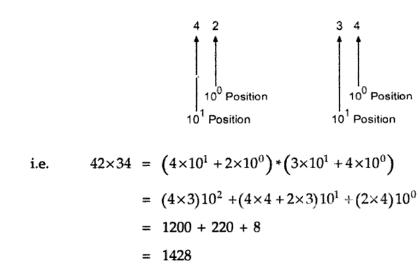 For example: consider multiplication of two integers 42 and 34. First let us represent these numbers according to positions. Let perform multiplication operation with the help of formula given in equation 1. Clearly, this algorithm can be implemented using recursion. This recursion can be stopped when n reaches to 0.